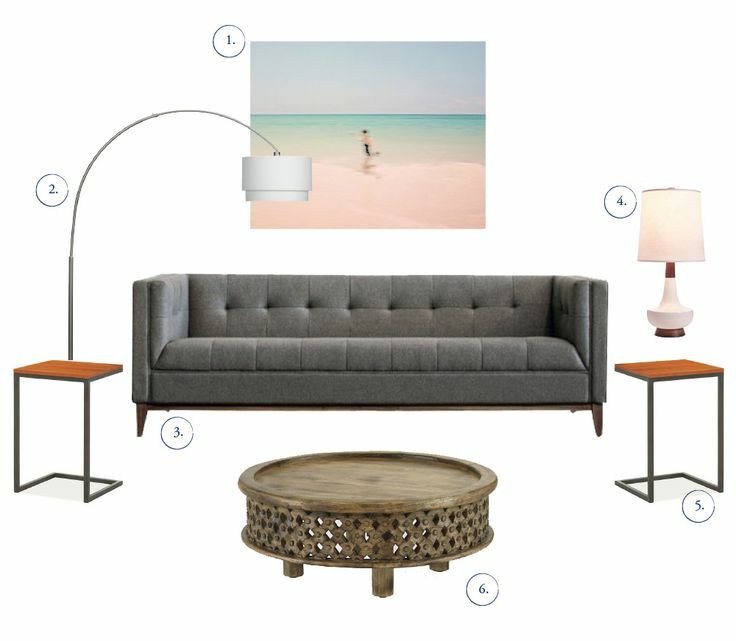 welcome back, loves, to my series for the week: remixing (ok, completely re-doing) the decor of an old childhood vacation spot, a darling but outdated lake cabin. i have teamed up with some very talented designers and bloggers to create a virtual showhouse tour, showing off what we would do with the cabin if it were ours. i kicked things off yesterday with a redesign of the front porch. today, my guest designer is kyla from house of hipsters. i'm so excited to have her on the blog. her talent for sourcing unique and eclectic (and awesome) pieces is unparalleled. seriously, if i could pick a personal shopper for my home, she would be it. kyla will be tackling the family room and dining space, which are open to each other on the main floor. below is a shot of the family room. those double doors lead into the house from the front porch, so this is the first room (and really the only main living space) of the cabin. so, you know, no pressure. hi guys! my name is kyla, and i have a little space on the internets called house of hipsters. i’m a graphic designer by day with a passion for interior design, fashion, photography and photobooths. i absolutely love thirfting, and if i could spend every weekend digging through estates sales and flea markets, i totally would. i’m super excited to be a guest blogger on this super cute cabin makeover, and i can’t wait to see what grace and summer have in store for us. i picked the dining room and living room since both spaces flowed together. what i was given to work with was…hmmm…not exactly a glamour house, but just wait…we are gonna work some magic. first things first, paint that wood paneling white...paint the ceilings white...everything is going white folks...even that brick on the fireplace. the space is small and the white is going to make it appear larger...brighter. next, let's do away with the carpet and hope those original wood floors laura's been raving about are still there. i want them a bit distressed…weathered…beachy! i’m a big fan of mid-century modern...that's no secret. 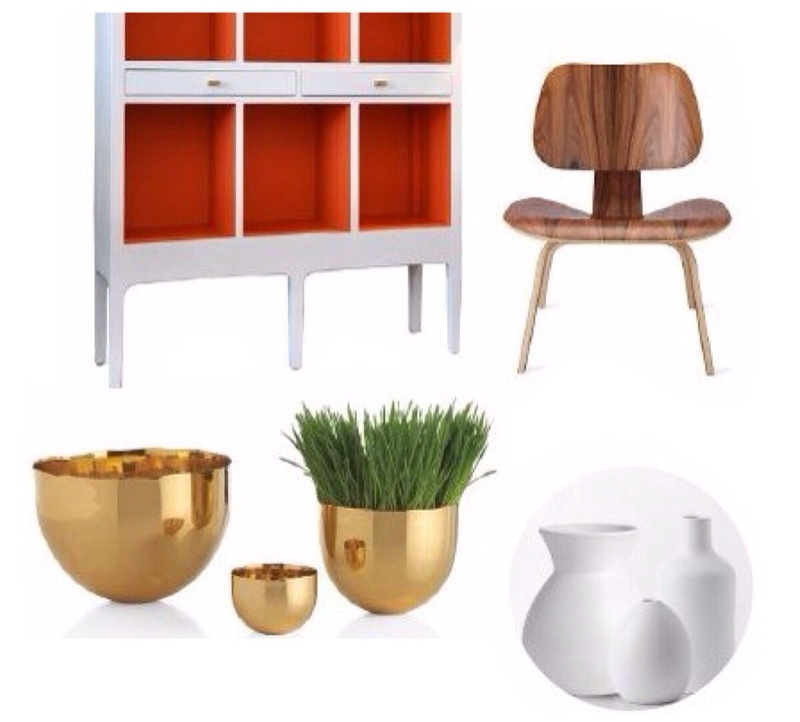 normally i choose distinctive vintage pieces but for this post, i really wanted to make these rooms shopable. this meant i had to dig waaaaay deep into my bag of tricks for places that were reasonable, affordable and unique…challenge accepted. ya, it would be super easy to say, oh just go to room and board and spend five large on a dining room table...but let's not do this; let’s TRY to keep budget top-of-mind (berg, i sound like the big i’m married to). now, i say this, but also feel every room needs to have a couple (few) splurge pieces...something that makes your guests go wow and makes you smile every time you walk into that room. something REALLY special. since this is a getaway place i’m assuming the homeowner (me, obvs because i so am moving in, right?) will have guests. i tried to keep extra seating in mind by adding extra chairs, a bench and ottoman so no one has to sit on the floor. i wanted this space to be soft, cozy and inviting yet sophisticated. let's start in the living room...a sofa is never cheap but i found this one at gus modern…word to the wise, they usually have an annual sale late summer that will save you around 20%. the dark charcoal color of this one will help hide the stains. flank either side of the sofa with these simple side tables. i love them because you can easily move them about a room and they also are big enough for a laptop and double as a small workspace. let's talk lighting. since we are not going to install pot lights in the ceiling because let's not get crazy here and rewire the place, i opted for a high arched floor lamp to give some overhead lighting. put it on a dimmer to make the room cozier in the evenings. and then there is that beautiful caravan pacific lamp. the lamp that i love with all my being. i'm seriously obsessed. to soften that wood floor, let's lay down a pretty vintage persian…i couldn't afford it in my own foyer, but in my dream lake house, apparently i can...LOL. you could always opt for jute or sisal here if the persian price was out of control or you wanted something more neutral, and the jute would bring in the color of sand along with some texture. the chair is from joybird furniture and brings in that soft turquoise water color. i did choose a vintage franco albini rattan ottoman…i couldn't help myself; it brings in the sand color. do a search on google and you can usually find them for a couple hundred dollars…$300 tops…seriously, don't pay more. they bring a bit of added texture to the room and if you weigh under 170 lbs-ish, you can usually sit on one without crushing it. i know i said no vintage...but i fibbed just a bit...this piece is still shopable and obtainable, you just have to have patience and hunt a bit…google is your friend. now, i’m not a fan of sailboats, anchors, fish and seashells in my decor. yes, you live on the water, but let's leave the seashells on the beach, shall we? so how do you successfully achieve beach-chic and keep long john silver far from your harbor? think fresh. incorporate beach-themed elements in a non-traditional way. i'm steering clear of anything nautical and incorporating beachy colors by choosing soft pops of turquoise and adding in some bleached tortoise shells with beach-chic artwork on the walls. did you see that old tv in the corner, ya, let's get rid of it and hang a flat screen over the mantle. don’t you crinkle your nose at me! stop it right now! i know, i hate the tv over the mantle, and i know you are on vacation (go play some euchre and unplug) but let's keep it real, most everyone will want to keep their tv. 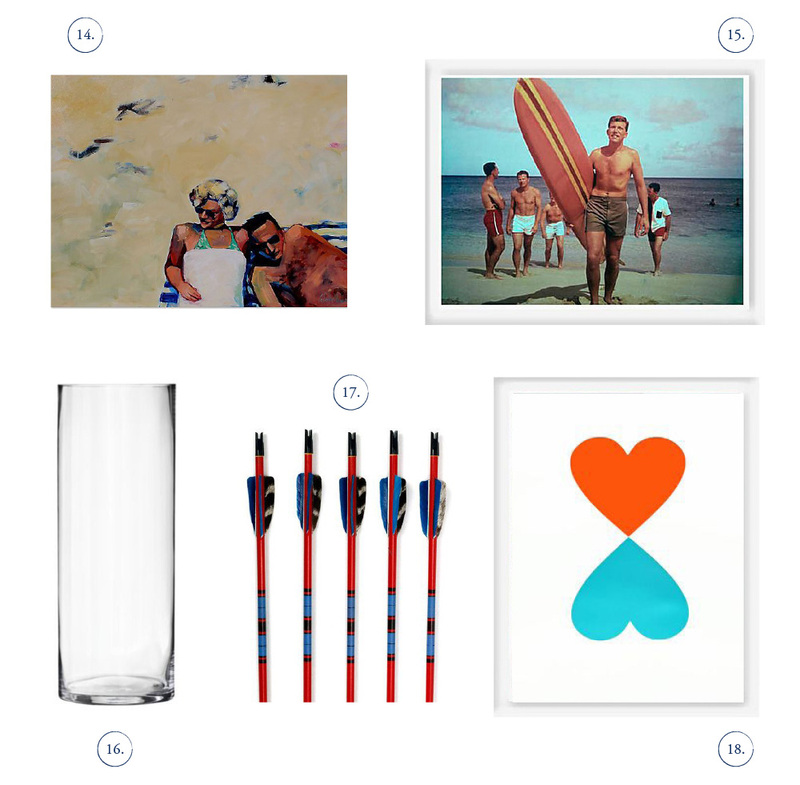 if you chose to stay tv free, take the max wanger splash photo, frame it in white and place it over the mantle…add a nice collage of artwork and unexpected items over the sofa instead. speaking of the mantle, let's remove the dark wood and replace it with a pretty chunk of reclaimed barn wood, shall we? mmmmm, yes ma'am, now we’re cookin’! okay, this is where i start to dip my toe in taboo waters. go to your beach (no, no shells, i mean it) and pick up a couple bowls full of beige rocks…try to get them all in the same light beige color. now take the glass vessel from target and carefully pour the rocks in about 4" - 5" deep. 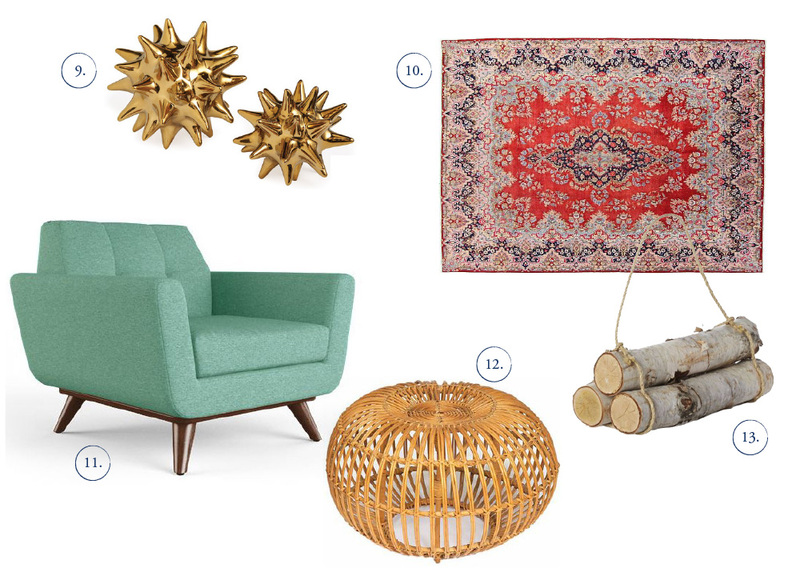 Stick those pretty vintage arrows in there and place on the mantle with the gold urchins from dwell. boom. ready for the dining room? the table is from hd buttercup and has sort of a distressed vintage look to it. i found these eames knock off dining room chairs at overstock as a two-fer! $148.99!!!!!!! yeah buddy! i'm going to say get six of these, you will thank me for it. i'm going to top it with this oversized vessel from pottery barn with 1 large split philodendron leaf which i found at jo-ann's fabric…it’s silk so it will be there for every visit and never wilt. can we just take a moment…a short pause to revel in the beauty of that bookcase? i love that punch in the face of orange. you probably noticed a few small pops in the living room, but shazam, check you out you pretty little bookcase you with your fancy brass pulls. i think i kind of love you! seriously, might be my favorite thing out of everything in the two rooms. so remember when i was saying let's spend some money on one or two pieces to really add some zing to your space. well my friend, this is where i dropped some coin. i'm sorry, i couldn't help myself (whaaaaat? it works with my husband). this puppy also adds some height to the room bringing your eye up and keeping a flow in the space. 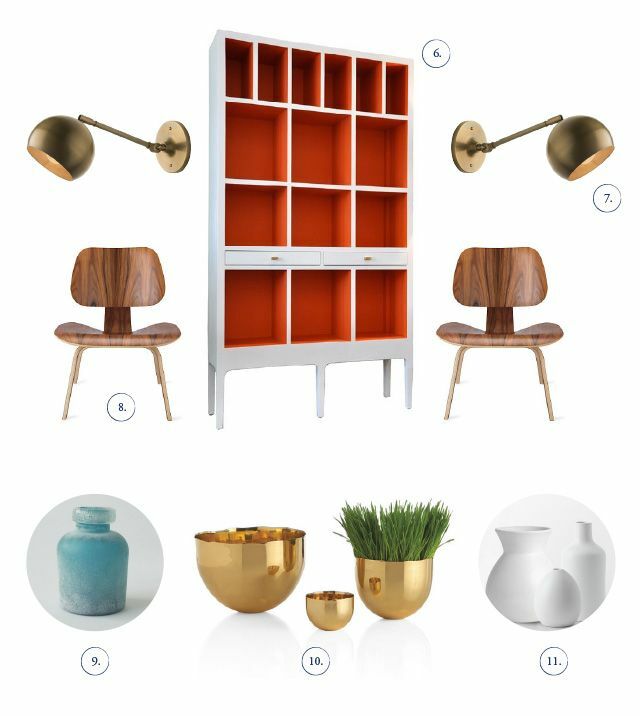 flank either side with a beautiful brass sconce from schoolhouse electric and an eames molded plywood lounge chair…okay, so you are shaking your head saying lady, there is no way i can afford those chairs! are you crazy?!?!? well, ok, i'm always open to having options, so you can always try these instead. i wanted items on this bookcase to still pop, even with all that orange, so i chose white vessels from west elm along these waterscape vases. the salt-blasted glass has the look and feel of sea glass. for a touch of whimsy, write a note, roll it up and pop it in (you could leave extra vintage paper near it for guests to write about their adventures as well). i think a bunch grouped together in different shades or a few of the smaller vessels sitting by the white vases would look fantastic. i have a huge blank wall that looks to have a closet. i don't want to take anything away from my magnificent bookcase, so i'm adding in a piece of oversized artwork. now i picked this piece by stephanie vovas, but you could really do anything you want here…even a family photo will work, but in that case, i’d stick to black and white. i'm just looking for something oversized. you do not need another piece of furniture on that side of the room. i'm envisioning a bench to to be nestled in-between the two windows. this bad boy is from the same source as the bookcase — a tiny store in los angeles named empiric studio…and yes, they deliver…i know this as a fact. i do not shop there often because it is more pricey, but when i want a real substantial piece that is ridiculously beautiful, i go to empiric. 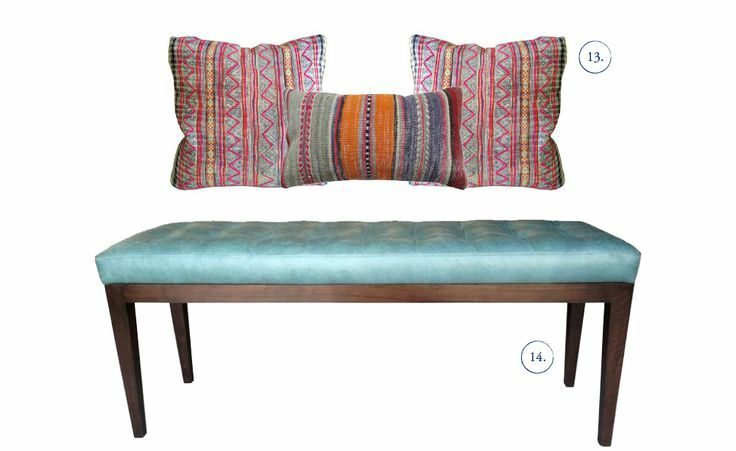 this bench is perfection with it's turquoise leather cushion. i topped it with a couple batik and vintage kilim pillows from amber interiors…again, you will see the pop of orange. as an added bonus, you now have more seating if you need it. hang the faux gazelle horns above and you have yourself a nice little vignette. on the shorter side wall, i'm going to add in the pleated mirror from west elm and bring in some beach-chic with the bleached turtle shells from jayson home and garden (another favorite store of mine). so, that folks, is my living room and dining room, but before i go, i have a funny (quick) story about laura and me. we met as neighbors a long, long time ago. see, one day she and her husband came home to my boyfriend and i grilling in the driveway…because that is what you do when you live in a townhome and have no backyard. we had talked in the past, but just the general hellos and goodbyes that you give to neighbors you like (the ones you don’t like, you just wave and run away). well, this day was different, this was the day my husband proposed to me and poor laura was the first person i told…THE VERY FIRST PERSON! i was in full on freak out mode. she was so nice and listened to me rant and rave for like 30 mins. so thank you laura for being so nice to me that day and thank you so much for inviting me over to avery street to be part of this special project so near to your heart. seriously ya'll, when kyla first sent me these graphics, my mouth fell open. i want to go to there!! when can we move in?! for more weekly inspiration and amazing finds (and to drool over what she's got going on in her own house), be sure to visit my friend at house of hipsters and stay awhile. in case you missed it, visit the porch that leads in to today's lovely space (not that i'm biased but it's like totally awesome)...and stay tuned for tomorrow when my girl grace will be sharing her ideas for a fabulous new kitchen! 17 // vintage arrows- lackluster co.
so have you won the lottery yet? i really want to move in! can't wait to see what grace and summer have cooked up! woohoo! The more I see the more I want to move in...or at least visit! Great designs Kyla! 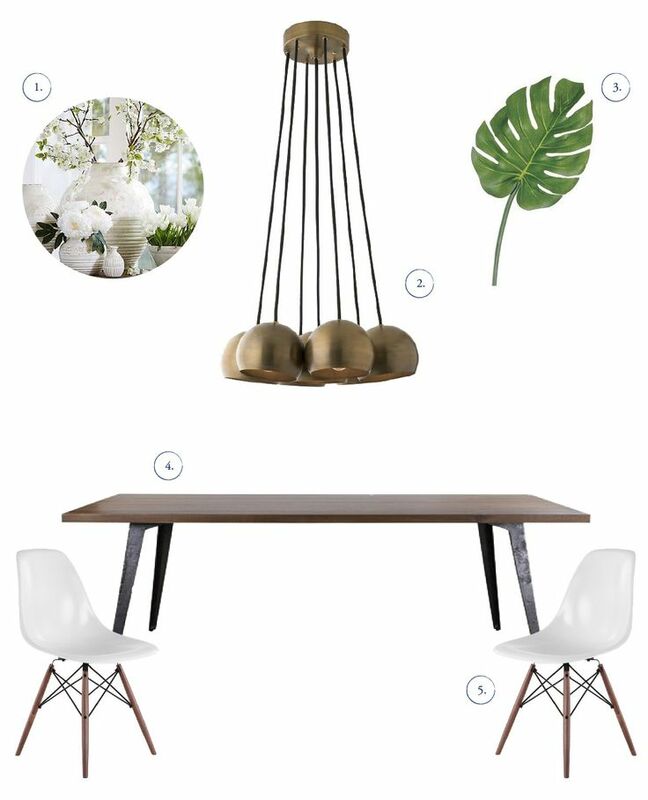 I'm totally smitten with the rustic and modern elements, the earthy wood and bold metallics! Amazing job! Love this, Kyla! So beautiful. Can't wait to see Summer's bathroom tomorrow! You always know where all your family members are no matter what time of day. Parents and guardians can keep the application protected, as it is password-protected and therefore tamperproof. Just download this tracking app. Click on this web link sprint family locator app mobile reviews for more interesting information!